Chinese payday loan company Qudian Inc. made a splash in 2017 with its $900M IPO. Whether in Southeast Asia, Europe or Latin America, there sure is money to be made in personal credit. But there’s also money to be lost, due to fraudulent targeting of the industry. It is all part of a larger increase in attacks against online businesses in any vertical. As we’ll see, payday loan companies are a particularly high target. This post examines why and tries to offer a solution to the problem. The easiest way to stand out from the crowd for payday loan companies? Offering fast, frictionless lending. This means accelerating credit scoring, at the risk of losing customers if it takes too long to process. As you can imagine, this is the perfect opportunity for fraudsters. Faster credit scoring means fewer verifications. Fewer verifications means more ways to take advantage of the lender. Lending is a 100% financial service. There are therefore fewer barriers between fraudsters and their access to money. 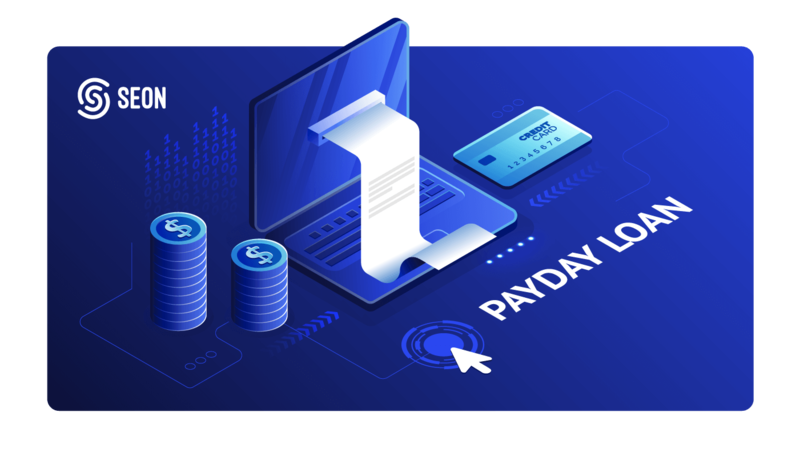 While, say, cloning credit cards incurs numerous steps, the results from targeting a payday loan company are immediate. If it works, they get paid. If it doesn’t they move on. Wider Internet access, worldwide increase in mobile use, and cheaper consumer tech all contribute to a growing market for online lending companies. It also creates a fruitful and risk-free environment for fraudsters, who can switch devices, IDs or even IP address as they please to multiply their loan applications. One thing there is no shortage of in the fraud world: stolen IDs. 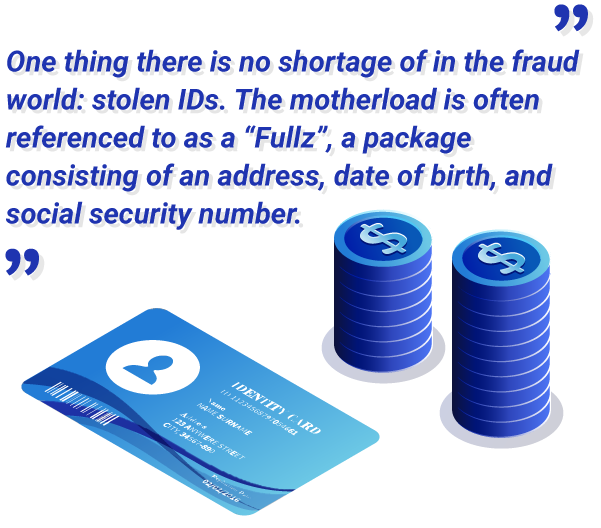 The motherload is something called Fullz, a package consisting of an address, date of birth, and social security number. 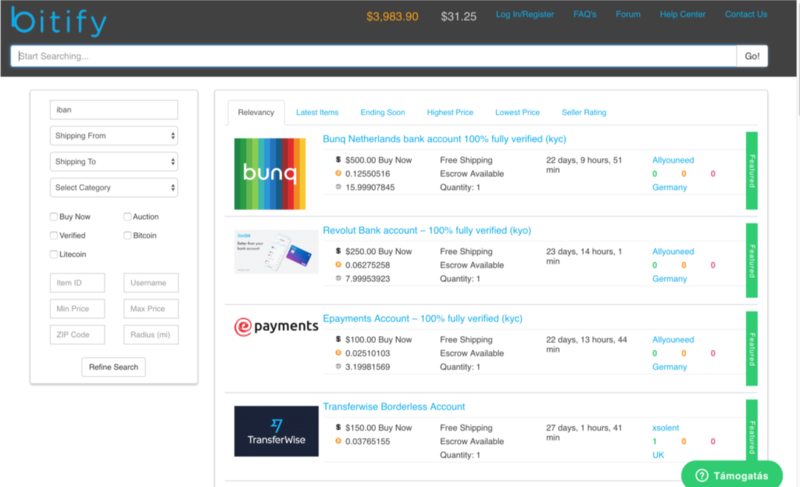 Criminal marketplaces: Clear and dark web sites offer plenty of platforms where you can sign in anonymously, pay with untraceable crypto, and bulk buy IDs to use for any of your fraudulent goals. Data breaches: While cybercrime isn’t necessarily organized, fraudsters benefit from actions by other hackers as a data breach means access to legitimate IDs and passwords. These can be used to recover other information to create a full stolen ID profile. Phishing: the old days of mass-sending emails are over. These days, fraudsters use increasingly sophisticated methods, such as creating fake job posts to steal ID, targeting the clean credit history of children profiles, and personalised phishing – also referred to as spear phishing. Even more specific: fraudsters can filter stolen IDs based on credit score. It’s also easy to check it manually, using sites that let you consult a credit score by making a card payment. Do you believe photo ID verification works? For fraudsters, it is but a minor inconvenience. 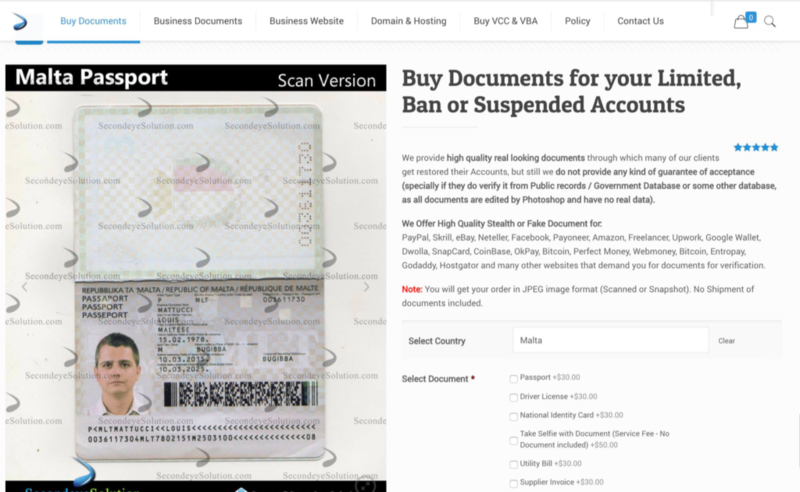 They can Simply log into a service like Secondeye, order a tailored, photoshopped document, and bypass secondary ID checks in no time. Historically, receiving and storing funds was one of the biggest headache for fraudsters who managed to successfully apply for a loan. This is now a thing of the past as modern digital banking solutions have created a market for cheap, disposable accounts. Fraudsters can simply purchase a legitimate online bank account from TransferWise, Revolut, or any other fintech to store the fiat. It’s then easier than ever to buy cryptocurrencies, which can then fund their next fraudulent venture. The lending industry is intrinsically based on risk. Interest rates are calculated on risk. Credit scores evaluate risk. Taking risks increases competitive advantage. The good news is that risk is a measurable factor. This makes it easier to integrate services or processes that mitigate it, while calculating your ROI. For more information about faster, more precise credit scoring with our fraud prevention tool, please check SEON’s Intelligence and Sense solutions.